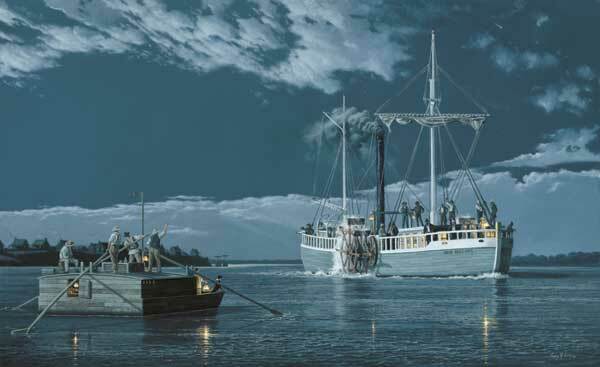 The Roosevelts arrive in Louisville with the Great Comet in the sky above them (painting by Gary R. Lucy). The Great Comet of 1811, first observed in March and easily visible in the night sky during September and October, made a dramatic backdrop for the first weeks of the trip. More information on the Great Comet of 1811 is available from astronomer Gary W. Kronk. Dec. 27, 1811, Pittsburgh Gazette - the phenomena of the earthquake and the comet suggest that Nature can "no longer tolerate the moral turpitude of man"
Feb. 22, 1812, Western Spy - "various conjectures" about the cause of the earthquake include "the comet's near approach to the earth"